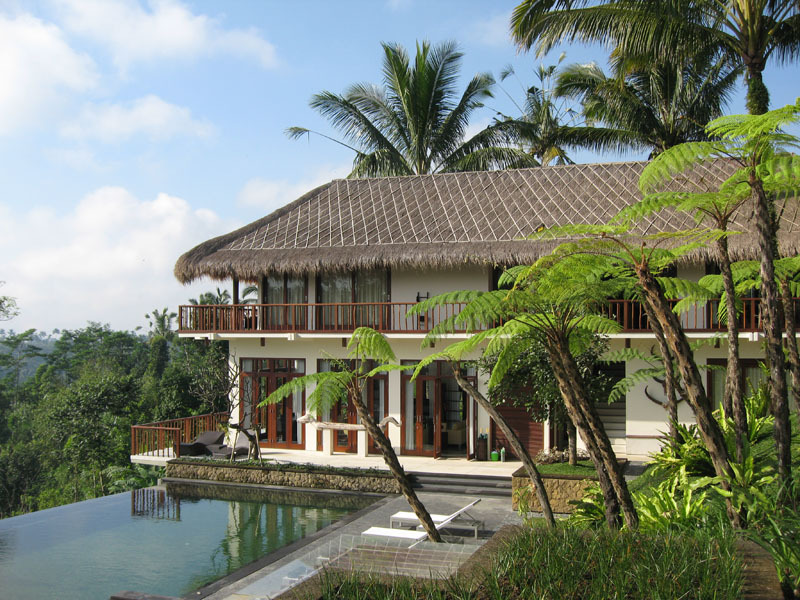 This villa is located 20km north Ubud, the capital of Balinese artists and 10km north of Payangan, on Buahan main road. 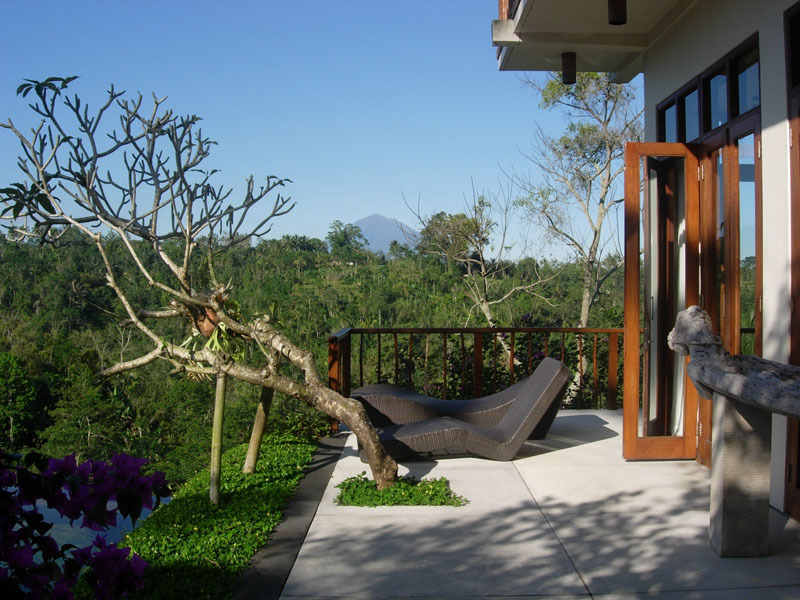 At an altitude of 700m enjoys a fresh and healthy air (temperature 5 derajat celcius less in average than in Denpasar). Average temperature: 26 derajat celcius (day), 20 derajat celcius (evening). 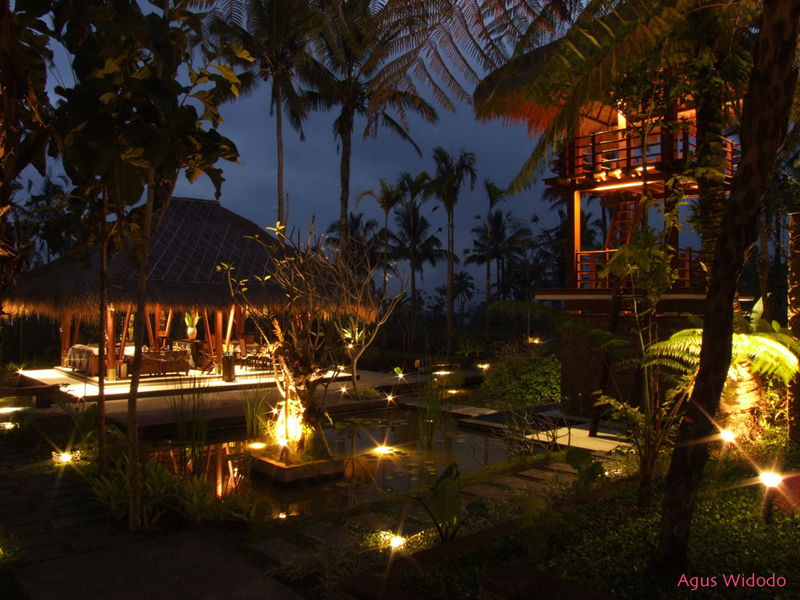 A wide tropical garden, with giant ferns, teak and frangipani trees, hibiscus, shady palms, lotus and lily ponds, will embrace you with the serenity, harmony, and beauty of the Island of teh Gods. 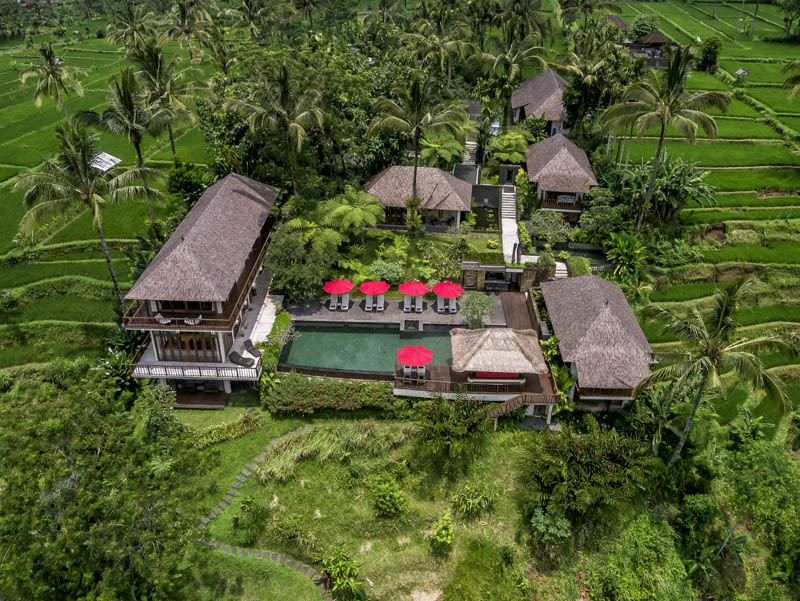 From the traditional kul-kul, you will enjoy the dramatic view on 270 derajat (forest, rice paddies, gorge), among the best in Bali, the Mounts Batu Karu, Batur, and Agung in the background. LAND SIZE : 127,25 Are (12.725 sqm), divided into 10 certificate. BUILD SIZE : 1.499,70 sqm. 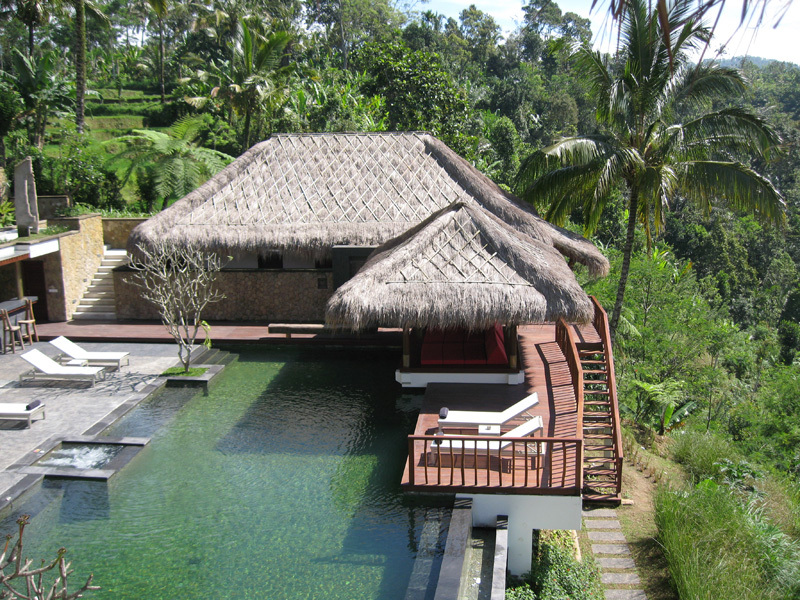 Surga (2 levels) : 431,40 sqm. Dining Bale : 65,70 sqm. Kul-kul Tower (2 levels) : 48,00 sqm. 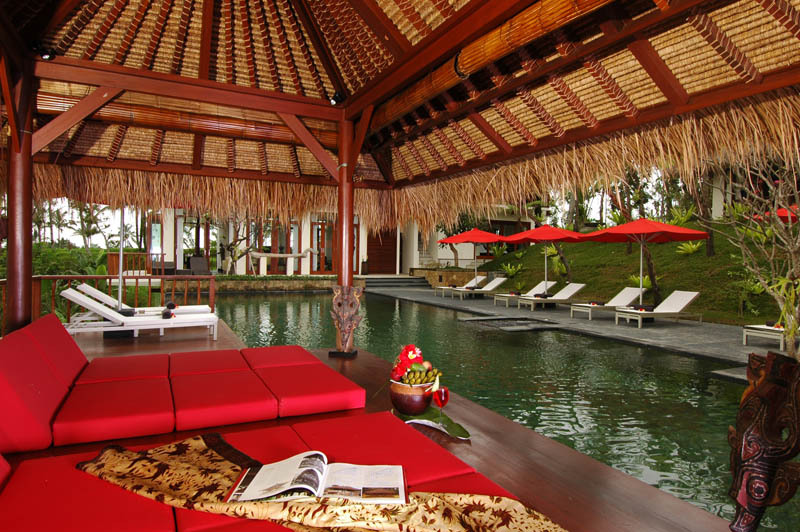 Pool Bale : 38,50 sqm. Valley Bale : 17,60 sqm. Golf Meditation Bale : 2,60 sqm. Miniature Golf Veranda : 34,00 sqm. Entrace Upper Garden : 7,80 sqm. Check point and Covered Passage : 13,80 sqm. Pool Bar & WC : 21,50 sqm. Pool technical terrace & Heating installations : 21,00 sqm. Sawah club (Billiard pavilion) : 120,50 sqm. Trenggana spa : 137,40 sqm. Lower spa & chromotherapy : 9,00 sqm. Fitness gym : 28,80 sqm. Gym & lower spa covered terrace : 21,25 sqm. - Bedroom : 5 ensuite - pavilions. 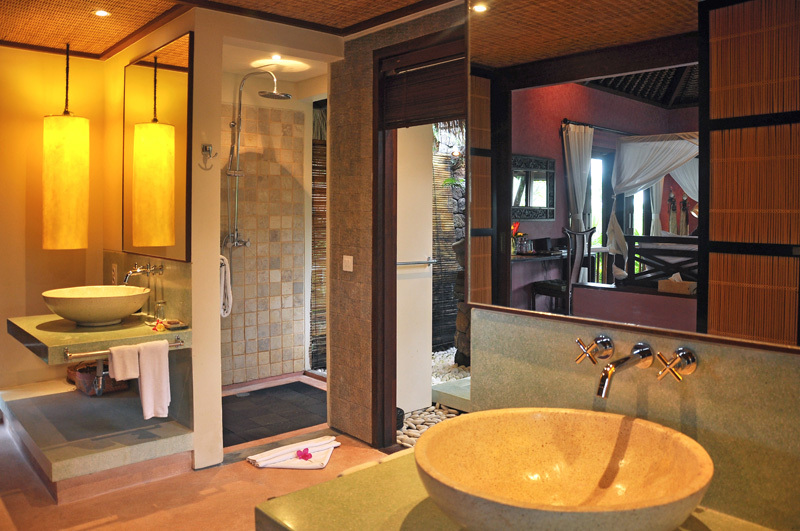 - Bathroom : 7 bathroom. - Swimming Pool : Yes. (20 x 6,66m) 133,2 sqm. - Water Resource : Wheel Drawn Water. - Electricity : Yes. 60.000 Watt. 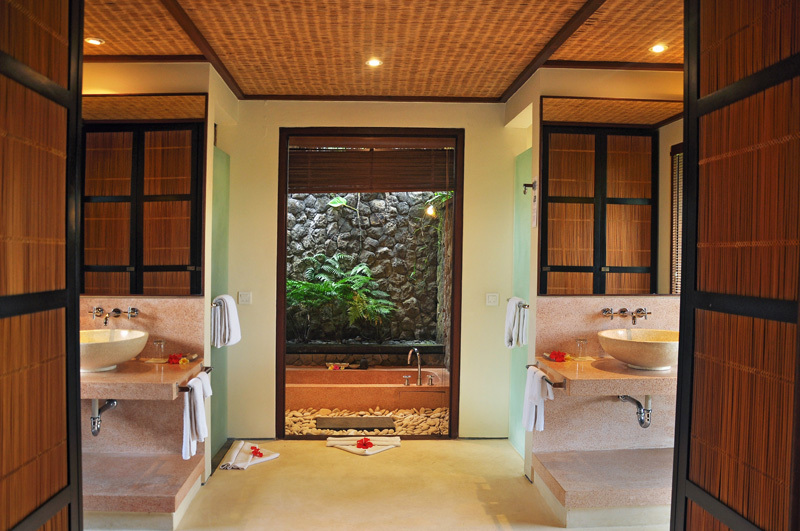 - Distance : 20 km drive to Ubud and 10 km to Pangyangan. - Staff Quarter : Yes.